Paul McCartney Shares Photo From Abbey Road Studios While Recording New Album 'Egypt Station'. Beatles Radio: The Beatles, Solos, Covers, Birthdays, News The Fab 4 and More! 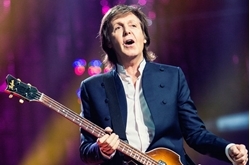 After hinting at new music and the release of a double A-Side single, today (June 20), Paul McCartney announced the release of his 17th studio album, Egypt Station, for Sept. 7 on Capitol Records. The announcement of the upcoming album, Egypt Station, named after one of the former Beatles’ paintings (see below) comes as extremely exciting news to fans who’ve been waiting almost 5 years for new McCartney music. He's also released two new tracks -- “I Don’t Know,” and “Come On To Me” -- and if they are any indication of what to expect, we’re in for a wild ride of head banging rock, as well as heartfelt ballads. Both singles, along with the rest of the album were produced in by Greg Kurstin and recorded between L.A, London, and Sussex.